perfectly moist and flavorful every time!! it’s meatloaf. mister loaf. the mac daddy of all the comfort foods. the guy who even manages to steal the show sandwiched between a couple of delicious bread slices on day two. 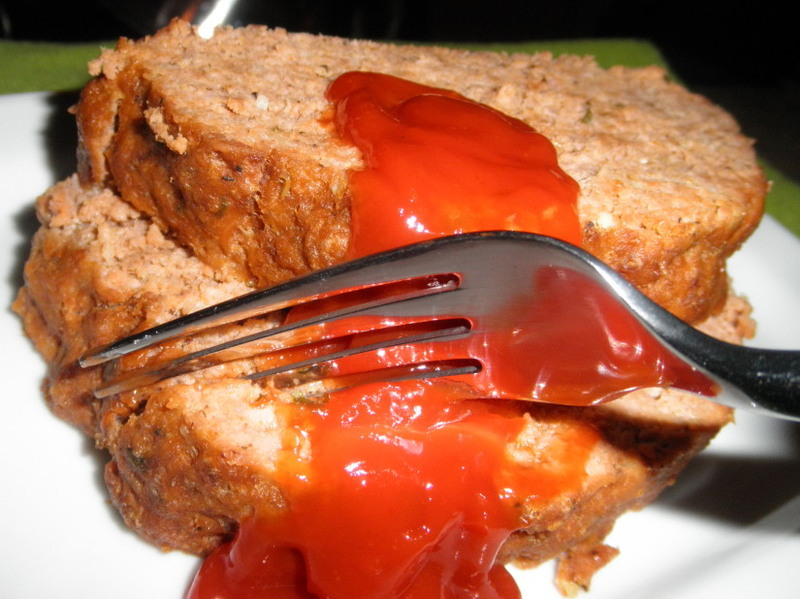 maybe you loved your mom’s meatloaf… maybe you hated it. mine happens to be an adapted version of my mom’s already near perfect recipe. like everything i make, it has evolved over the years. play around with it, yank it around and make it your own. tonight my husband made it and he added a 1/4 cup of yellow mustard to the mix. it’s something i never would have considered doing, but hot dog was it delish!! he served it up with some Betty Crocker augratin potatoes and peas, and it made our thursday pretty solid. hats off to meatloaf lovers across the board. pour a little milk over top to moisten. (maybe a 1/3 cup) -give a few minutes to soak in while you’re prepping other ingredients. little puddle of steak sauce if you have it (maybe a Tablespoon??) if don’t have, no sweat. 1 heaping tsp of dried thyme if you have it (if not, no worries). actually… get some thyme. everyone should have some. use it on all sorts of meats and roasts and in soups and stews and spaghetti sauce. i go through it like crazy. Add all of these ingredients to the meat bowl. Add bread crumbs by feel, start with maybe a 1/4 cup- which may be enough actually, and mix by hand to desired consistency and then shape like a loaf. You’re kind of going back and forth between two hands over the bowl with the whole thing, patting it into shape. Place it in a round glass pyrex dish with a lid. This helps lock in the moisture. Add 1/4 cup of water around loaf. i like to sprinkle the top with salt and pepper. Tonight i did a drizzle of Carolina BBQ sauce over top and rubbed it in with my hands before popping it into oven. it soaked into the meat and gave it a delicious salty tang!! some folks like to do this with ketchup on the top. you do you! fine with neither to be honest. Cover and bake for one hour and 20 mins at 350 degrees…. or you could do 325 for two hours. Time it out to best suit what you have going on. Drain some fat/ juices out of the dish a couple of times during cooking. At end, take the lid off and let it rest 20 mins in the bowl you cooked it in, and then remove it to a cutting board or serving platter. Slice and enjoy! YAY MEATLOAF! !